Your Cheap Living Abroad Plans Start Now! 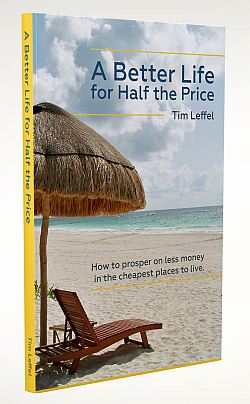 This is the website for those who want to cut their cost of living in half without cutting back and sacrificing. It’s for those who want to start getting ahead and living a better life by just changing their address. You’ll find more than 50 tales like this in the book A Better Life for Half the Price and if you sign up for the community packages, you’ll be able to ask questions of them and me to find out more. I’m living the half price life in central Mexico, with my family, where we eat out more, travel more, and don’t have to pay 1/5 of our income on health care. There are a million people out there living a better life for half or less what they used to spend in the USA, Canada, England, or Australia. They’re scattered across value-priced locations stretching from Patagonia to Mexico, from the beaches of Thailand to the mountains of India, from the west coast of Europe to Transylvania. You’ll hear from couples living an extravagant life for less than $2,000, singles who have cut their expenses from $4,000 to $1,400 while upgrading their apartment, and retirees who are living well on just their social security checks. Instead of cutting back, they’re cutting loose instead. I’m one of the million eating out more, having a maid come every week, and getting health care check-ups without worrying about what the cost will be. Through international living, I’m stressing less about finances and enjoying life to the fullest instead. If you’re just curious, I’ve got a great book for you that will tell you whether this is a life worth pursuing. If you’re already committed, you can get more reports, join a dedicated community, and tune in to interviews with expatriates from places you may want to live in. If you’re all-in, you can do all that and also get your questions answered by the people who know the answers. Want to hear more stories from expats living abroad for far less than they were spending before? Find out more here.